Movie Review: Once a bully, forever a bully. 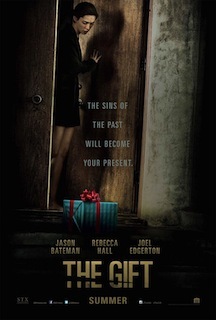 This is an aspect that “The Gift”, a dark, twisted thriller directed, produced, and co-starred by Noel Edgerton, tries to emphasize when depicting the very strange re-encounter between Simon (Jason Bateman), a successful tech executive and a former colleague from High School, Gordon Moseley (Edgerton), who responds by the nickname ‘Gordo’. Simon moves from Chicago to a gorgeous, spacious house in a calm neighborhood of LA, in the company of his good-natured wife, Robyn (Rebecca Hall). For them, this change kind of works as a new opportunity after Robyn’s recent traumatic miscarriage. When the couple seemed to have gathered the perfect conditions in order to enjoy life unreservedly, the invasive Gordo, who had been severely bullied by Simon in the past, decides to gift the couple for several times. In addition to that inexplicable behavior, he keeps visiting Robyn when Simon is at work, and is caught in an embarrassing lie when he invites the couple for a dinner in a house that wasn’t his. Yet, also Simon, whose self-assurance is often transformed into arrogance, is caught lying when he says to his wife he doesn’t remember Gordo so well. The apprehensive Robyn ends up troubled by Gordo’s words ‘let bygones be bygones’, written in a letter addressed to Simon. She won't give up trying to find the truth behind these words and the reasons why this odd man stalks them. The film builds a few awesome Hitchcockian tense moments, even taking a recognizable path and adopting a typical mood while presenting us a couple of good twists, which maintain our eyes wide open. The ending, characterized by severity and sickness, evokes shocking final revelations such as those depicted in “Seven” and “The Usual Suspects”. It’s known that long-term abuses can lead to merciless actions and retaliations. This one, in particular, goes beyond the physical. Edgerton shaped the characters with insight and entered with the right foot in the filmmakers’ universe.